The Caravel Corsairs is a crew on the Emerald Ocean, founded on the Sage Ocean, flying the flag Cocktail Party. It is led by Moel, and was part of the flag Go with the Flow. 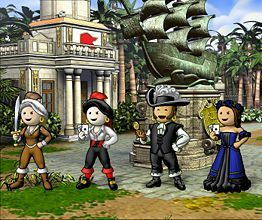 The Caravel Corsairs was created on August 24th, 2005, by Katryvna and Moel, with the help of Krauser. They migrated over from Viridian in search of new adventures, and looking to start new business ventures. The crew name was created by researching pirate vessels in the 15th and 16th centuries. Caravels were small, light sailing ships used by the Spanish and Portuguese, and corsairs were the pirates that sailed them. Arr! This article about a crew in Puzzle Pirates be a stub. Ye can help YPPedia by expanding it. This page was last modified on 24 August 2012, at 17:35.